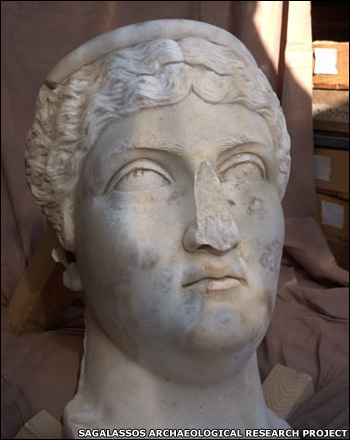 Archaeologists digging in Turkey have found the colossal marble head of a Roman empress. It was discovered in a rubble-filled building where parts of a huge statue of the emperor Hadrian were unearthed last year. The discovery, at the ancient site of Sagalassos, is thought to show Faustina the Elder, wife of Roman emperor Antoninus Pius. Sagalassos was once an important urban centre. It was abandoned after being hit by several strong earthquakes. A team led by Marc Waelkens, from the Catholic University of Leuven in Belgium, has been excavating the site since 1990. The head of Faustina was lying face down in rubble that fills the ruins of a bath house that was partially destroyed by an earthquake between AD 540 and AD 620. 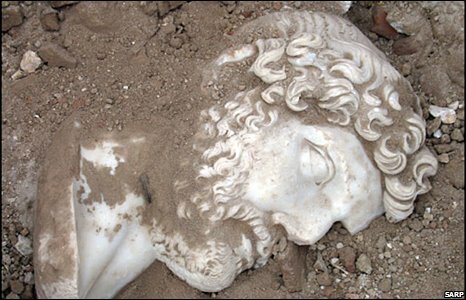 It was unearthed just 6m from the spot where the Hadrian statue was found, but was sitting higher up in the rubble. At first, exacavators thought they had found a statue belonging to Hadrian’s wife, Vibia Sabina, who was forced into a marriage with the homosexual emperor at the age of 14. But when they turned it over, the face was very different from the usual depictions of Sabina. This was a more mature woman with fleshy lips and a distinctive hairstyle. Experts said most of the features of the head identify the woman as Faustina the Elder. She married Hadrian’s successor as emperor and adopted son, Antoninus Pius. Faustina was well respected, especially for her charity work. She enjoyed a happy marriage to Antoninus which lasted 31 years until her death in AD 141. In her memory, Antoninus formally deified her as a goddess. The building in which the statues were found at Sagalassos was probably a “frigidarium” – a room with a cold pool which Romans could dip into after a hot bath. It is part of a larger bath complex that is being carefully uncovered by archaeologists. The fragments were found not on the floor of the frigidarium – beneath the rubble from the earthquake – but higher up in the debris pile. This suggests they did not originally stand in this room, but were hauled there from elsewhere in the bath complex – probably from the “Kaisersaal”, or emperor’s room. They speculate that the Kaisersaal once hosted statues of Hadrian, Faustina the Elder and other members of Rome’s so-called Antonine dynasty – many of whom belonged to a Spanish or southern French provincial aristocracy. The Hadrian statue was probably brought to the frigidarium either to remove its gilded armour or to be burned to cement in a nearby kiln. The fragments are now on display at the exhibition Hadrian: Empire and Conflict at the British Museum in London. But the frigidarium did have colossal statues of its own. On the floor of the room, experts have found the front parts of two huge female feet, surrounded by mosaics that follow the contours of the statue’s long dress. Original article retrieved from here.